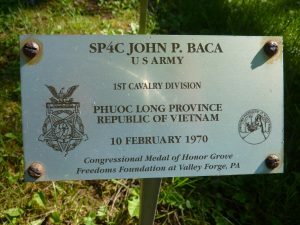 John Baca is honored in the California Area of the Medal of Honor Grove, near the Faith of Our Fathers Chapel and the Altar of Battles. During 2019, Freedoms Foundation and the Friends of the Medal of Honor Grove are paying tribute to the living recipients of the Medal of Honor on the anniversary of the actions for which they earned the nation’s highest award for valor. The series continues with a look at Feb. 10, 1970 and Spec. 4 John Philip Baca of the 1st Cavalry Division. “For conspicuous gallantry and intrepidity in action at the risk of his life above and beyond the call of duty. 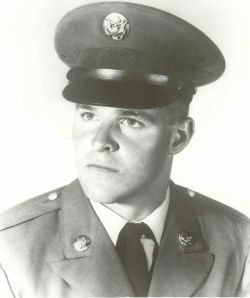 Spec4 Baca, Company D, distinguished himself while serving on a recoilless rifle team during a night ambush mission A platoon from his company was sent to investigate the detonation of an automatic ambush device forward of his unit’s main position and soon came under intense enemy fire from concealed positions along the trail. “Hearing the heavy firing from the platoon position and realizing that his recoilless rifle team could assist the members of the besieged patrol, Spec4 Baca led his team through the hail of enemy fire to a firing position within the patrol’s defensive perimeter. As they prepared to engage the enemy, a fragmentation grenade was thrown into the midst of the patrol. “Fully aware of the danger to his comrades, Spec4 Baca unhesitatingly, and with complete disregard for his own safety, covered the grenade with his steel helmet and fell on it as the grenade exploded, thereby absorbing the lethal fragments and concussion with his body. His gallant action and total disregard for his personal well-being directly saved 8 men from certain serious injury or death. Baca fall on the grenade and tried to get away — but the grenade went off. John Baca’s plaque in the Grove. Baca was flown out of the Phouc Long Province later that day … and was taken to a base hospital. Baca later spent almost a year at then-Naval Hospital in San Diego to recuperate from severe internal injuries. He received the Medal of Honor from President Richard Nixon on June 15, 1971. In 1990, the web site continues, as part of the Veterans Vietnam Restoration Project, John Baca, along with 10 other members, went to Yen Vien, a village north of Hanoi, where they spent eight weeks building a health clinic alongside the Vietnamese.